The author of ‘Ojala’ is friends with Mexico’s president-elect Lopez Obrador since a long time ago. 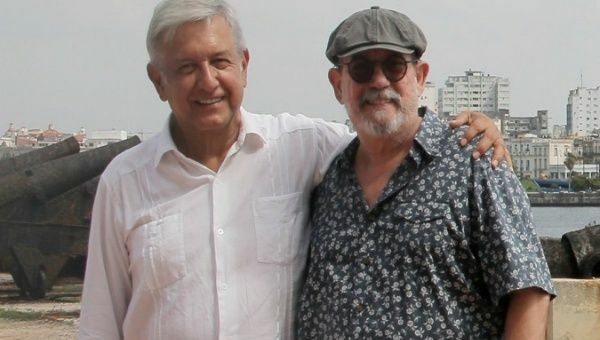 Oct 5 (teleSUR) Renowned Cuban singer and composer Silvio Rodriguez says he will attend the swearing-in ceremony of Mexico’s President-Elect Andres Manuel Lopez Obrador December 1. Answering a question by a fan on his Segunda Citablog, Rodriguez said he was invited to the ceremony and that he intended to travel to Mexico to attend. “I’ve been invited to my friend Andres Manuel Lopez Obrador’s swearing-in ceremony as president of Mexico and of course I’ll go,” he wrote. The singer has shown his support for Lopez Obrador in the past, and was with him at the Zocalo, Mexico City’s largest square, when the center-left president called to protest against the electoral fraud that declared Felipe Calderon president-elect in 2006. “They’re afraid of a government that defends the interests of the great majority of Mexican people, defends the national interests of Mexico, and brings Mexico closer to Latin America,” wrote Rodriguez in a post. “But that’s the hope of most of Mexican people and also Latin America, defeating neoliberalism and subordination to the U.S. to confirm a fair and sovereign Mexico,” he continued. It’s still unclear if Rodriguez will attend as a distinguished guest or if he will perform at the event.